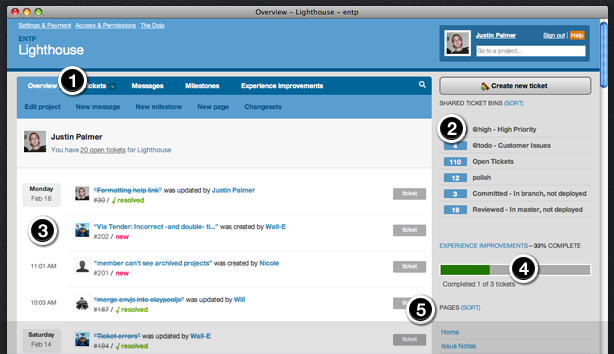 Over 50,000 people use Lighthouse every day to collaborate on their projects. Give it a try for free! No matter where you are, we have the tools to keep you up to date on your project. Browse tickets using our slick iPhone optimized interface, manage tickets through our robust email system, or use your feed reader to subscribe to feeds. Lighthouse's email integration is a thing of beauty – you can do just about everything with a simple reply. Need to reassign a ticket to John in accounting from your BlackBerry? Reply to the email notification with your message and [responsible:John] and you’re done! We give you all the tools you need to organize your tickets – custom states, a powerful tagging system, an advanced search, saved searches (we call them ticket bins), and a mass editing tool. The end result is a simple system that keeps track of issues that are important to you and your team. Whether you need to track fixes waiting for QA or urgent issues – ticket bins are your answer. Spend a few minutes setting up ticket bins to match your workflow and you'll have automatically updated groups of tickets that match your workflow. Milestones help you group your tickets in timely releases. Whether you're developing in week long sprints, or preparing for a product launch – milestones make sure you hit your goals. Our milestone page keeps everything in one place. One quick glance and you can see the milestone's goals, who's responsible for tickets, ticket status, and quickly prioritize tickets by person. Lighthouse even makes it easy to move several milestones at once in case you find you're not going to meet your deadlines. Thanks to our robust API, there are already dozens of useful services that integrate with Lighthouse. Some of these include Beanstalk, Exceptional, GitHub, and Airbrake. With a couple of clicks you can start managing tickets with commit messages, or transform your application exceptions into Lighthouse issues. If you're a developer and need even more out of Lighthouse you can take advantage of our API to do exactly what you need.